If you’re at all like me, you have sounds playing in your head all the time. I have little tunes that accompany me wherever I go, and which change depending upon my activity. Did you know that if you walk down the street humming your personal sound, it protects you from dragons?! 😛 My personal tunes do not include songs with words, except for one, in Hebrew. As we come to the close of the celebration of Passover for the year, I am reminded of the best known Passover song, Dayenu. This word can’t be translated, but if it could it would be something like “If God (universal life force, or whichever term you like) had given us only this one gift _______(fill in blank), things would be great, but God also gives us more!” I like Dayenu because it’s peppy, has a good beat, and gets me to do things quicker so I can go on to enjoy more of those gifts from the Universe. So, I play that tune in my head when I’m washing dishes, or the car; brushing my teeth (I have to get to the end of the song before I stop) or on the rare occasions I’m tidying up my workspace. 😉 So, in my own weird way, I celebrate Passover the whole year long. There’s my exercise music, as well. If I’m not exercising along with a video, I’ll play the theme from the movie Rocky in my head. I’ll bet lots of us do that. Another is my walking tune, or what I refer to as The Deck Walking Tune, but is really called Out on the Deck. This was written by Deirdra Kiai and is one of the many wonderful musical works she included in her great adventure game The Game That Takes Place on a Cruise Ship. I say more about that game here. To get to the music I mean, you have to start up the game and then walk out of Gert’s stateroom, take the elevator up one or more floors, and then walk along the deck. This is important (!) because I’m not referring to the first music you hear on the passenger deck (although I like that too, and it’s related), but to that on the upper decks. This music has refused to get out of my head although I haven’t played the game in a couple of months, and I’ve certainly heard other music since then. It has become “city stroll music”, for when I’m walking in town, looking in shop windows perhaps, or on my way to somewhere but not in a hurry. (I don’t have hiking music. Somehow when I’m in a natural setting, the sounds around me are the music.) I had to do a little bit of analysis to discover why I find this particular tune so compelling. It’s a seemingly innocent little tune when you first hear it, meant to be filler, I guess, for the gamer to get from one adventurous location to the next. But there is an edge behind that innocence. I played it through on my keyboard, and began to analyze its melodic structure as well as I could given the length of time between my music theory classes and now. Let me say right off that I did not study jazz, and Ms. Kiai uses a lot of jazz motifs in her work. It could be argued that the basic melody line is in natural minor (the “sad” sounding scale, also known as Aeolian mode) with a few jazz changes thrown in to, well, “jazz it up”. From my medieval musical background, however, I rather think it alternates between Aeolian and Locrian modes, which gives it a freshness and exuberance beyond the obvious. I won’t go into a lot of detail, here, but of the seven modes—or scales—used in most western music, the Locrian is the least used. Look how it’s been defined: “the ‘ugly duckling’ mode; so unstable and unsatisfying that most composers consider it unworkable.” I don’t know if it was intentional or not, but Kiai has taken these tones and made them workable, while at the same time their instability contributes both to the wobbly experience of walking on a ship’s deck, and to the precariousness of the game’s situations. In retrospect, I really believe this has subtly influenced my choice of walking music, as I tend to feel instability in the nature of reality wherever I go. This is not a bad thing. I enjoy watching reality form and re-form itself around me, and it’s good to have appropriate musical accompaniment on the journey. Garden Post: the one about my favorite book of all time. I’ve participated in a few book memes, and most of them ask for lists of favorite books in categories. I’ve never allowed the book I’m going to discuss here to be on any of those lists, because it’s so special it deserves a post of its own. The book is about spring, rebirth, and coming alive with a garden. I wanted to post this on my birthday because that’s a good day to think of renewal, and the book makes me feel fresh and alive. It’s also a book about spring, and spring has truly sprung here in the desert this year. 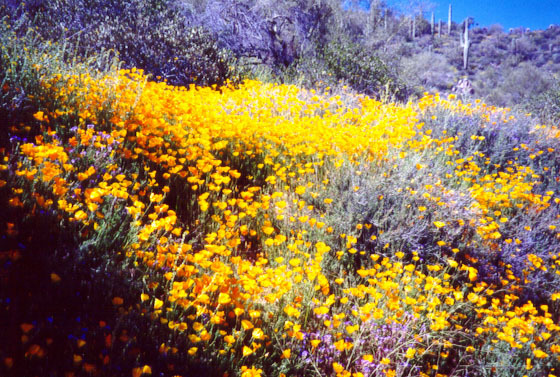 We have “good years” and “not as good years” for spring wildflowers, and this year is spectacular! I’m sprinkling a few photos around my post today so you can see what I mean. The desert blooms are not at all like the the cultivated English gardens of Yorkshire featured in the book, but are beautiful just the same. Even though I know Spring “officially” began in March, I tend to think of April as the “spring month”. 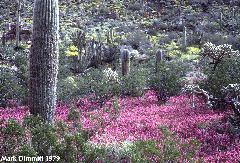 Besides, right before the Spring Equinox this year, our desert experienced rain and snow! Spring also reminds me of gardens and growth, and brings to mind an announcement I made at my college graduation ceremony. I attended a very small liberal arts college in San Francisco, and there were only about 25 people in my graduating class. We were each invited to “say something” at the commencement if we desired to. I chose to take the opportunity to donate a book to the college library, my battered but happy copy of The Secret Garden by Frances Hodgson Burnett. For those of you who have read it, The Secret Garden might seem like a strange choice for a college library—after all, it’s a children’s book, isn’t it? —Well, yes and no. I first read the novel, published in 1911, after acquiring it at a school book sale when I was eight. I was entranced at the time, and it started me along a philosophical path. At my graduation, my announcement contained the words: “…it’s a book about some children coming alive with a garden in the spring, and says a lot about my experience here”—“here” meaning at the college. I was grateful to have found a college that encouraged and enhanced my philosophical interests, and since The Secret Garden was the most profound metaphysical novel I’d read, I felt it belonged on their shelves. This novel, long before the discoveries of theoretical physics had been popularized, presented a belief system which seemed to me at the time to be logical, consistent, and, most of all hopeful! For various reasons during my childhood, this “hopeful” aspect was key to my development. I needed to know that things could get better, and that, with spiritual support, I had the power to change them from within. Here are some of my reasons for valuing this book: When we first meet the main character, Mary, she is bored, unpleasant, nasty, and unattractive: “When Mary had a headache, she did her best to see that everyone else had a headache, too.” But, gradually, as the tale unfolds, we see Mary transform, as she finds a garden to nurture, which in turn nurtures her. She meets some remarkable teachers along the way, and is able to use her new transformative power of thought to help others find joy. Mary and her friends are engaged in a “scientific experiment” which they called “magic”. They felt the magic coursing through their bodies, giving them strength and health. They saw the magic flowing through the flowers they planted, growing them from buds to blooms. And they felt the magic within themselves as they slowly realized they could transform unpleasant thoughts into joyful ones. The “…scientific experiment was quite practical and there was nothing weird about it at all.” Indeed, one reviewer believed the experiment was “…about love. About healing. About bravery, confidence, nature and those secret places in our hearts and our imagination”. Wow! This in 1911! This one paragraph is what gave me “hope” throughout my childhood. I hung onto those words until I grew up and was able to investigate such things for myself. To a small child who was not raised at all that way, they were truly magic, real magic. I have deliberately not said much about the plot, because you really must read it, or reread it if it’s been a while. The novel is exquisitely plotted, and is a delight to read. I hope I have given you a taste of the philosophy behind it. The book also started my lifelong love of beautiful gardens, and planted in me a desire to visit Yorkshire and England. Which I did, ten years after I first read The Secret Garden. I can punctuate however I want. to. I’m having an attack of typoitis. One of my few remaining faults (I only have four, now 😉 ) is persnicketiness. Many books and articles these days leave the editing process with a lot of incorrect word usage. Everything is spelled correctly because it’s been through a spell checker, but as we all know these don’t check whether we’re using the wrong word altogether. You get the idea. What bugs me about why this bugs me is that I don’t give a fig about wordy run-on sentences like this one having very little punctuation making you wonder if it’s ever going to end or go on and on until you don’t want to read the rest of this post. Or fragments such as this. Other grammatical liberties don’t bother me much either, as long as they literately express a consistent tone and quality. An infinitive is a wonderful thing to split! I tend to see these little usage violations as expressions of my creative style. Punctuation? Forget about it. I put in commas and question marks where I please, and I reserve the right to be inconsistent about how and when I close parentheses, and whether within or without the final punctuation. Can you read this? Olny srmat poelpe can! I cdnuolt blveiee taht I cluod aulaclty uesdnatnrd waht I was rdanieg. Aoccdrnig to rscheearch at Cmabrigde Uinervtisy, it deosn’t mttaer in waht oredr the ltteers in a wrod are, the olny iprmoatnt tihng is taht the frist and lsat ltteer be in the rghit pclae. The rset can be a taotl mses and you can sitll raed it wouthit a porbelm. Tihs is bcuseae the huamn mnid deos not raed ervey lteter by istlef, but the wrod as a wlohe. Amzanig huh? And I awlyas tghuhot slpeling was ipmorantt! Disclaimer: I claim no moral, legal or philosophical responsibility for any errors in the above blog post. If such are found they are due to (pick your favorite, I assure you it will be true): a. fatigue; b. the recent full moon; c. alien intervention. Thank you Juan of Bloggin’ Cool for coolly taggin’ me. Non-fiction book of the month? day? Spend many days in the musea and galleries of Washington D.C.
I’m not kidding about this. The human driver had WWI aviator glasses, a cigar in his mouth, a vest, safari pants, a kerosene lantern slung about his waist, spats or gaiters, and clinging to his back…a full sized parrot! I’ve experienced a lot of interesting people during my time on this wonderful and weird planet, but hadn’t seen quite that combination of features before. As I came up behind him, in the lane to his left, my first thought was he had a green aviator scarf about his neck. As I got closer, it occurred to me that his scarf was rather bird-shaped. Then…”it looks like he’s got a stuffed parrot slung across his shoulders” (cue the “Monty Python” music—was I suddenly in Ipswich? Bolton? Notlob?) As we both stopped at the light, the parrot turned its head and looked at me. The thing moved! It was a not-dead parrot! The bird seemed completely content, not appearing to desire to go anywhere or do anything other than cling to this strange fellow’s back, and ride. The biker drove slowly, and the parrot could have hopped or flown away any time. The man and bird continued up the road, while I turned west toward my home in another town. I’d just come from yet another committee meeting. Many people, at this point, might go on home—perhaps shaking their head a little—and discuss it with their friends the next day. They might try “Googling” this interesting pair (I did!) and then put the episode behind them. Being me, however, I had to pay attention to any symbolism this held for me. This man and his parrot might be local eccentrics (every town has them), but I’m the sort of person that believes that if something really commands my attention, it must have a message for me. I’ve only known one or two parrots personally, and found them friendly, intelligent and affectionate. When I lived in Hawaii, I visited a protected park where the parrots would eat out of our hands. I learned that parrots symbolised various things in different cultures: Bringer of essential rain and seed; heraldry; symbol of wisdom and of good counsel; good luck; known to repeat what they heard; distinguished service; the ability to communicate. I arrived home pleased with my day; my week; my life. I felt supported yet free. And my search results? I have not been able to find anyone who knows who this fellow is, but he has been seen around the area. I saw him after dark, and was not completely sure he wasn’t an illusion. I did find this from a fellow blogger, who links to a picture of Biker Bird and Dude in the Daylight. Yep, that’s them alright! Perhaps, as I did, you received an email about an elephant from Thailand who paints pictures. Perhaps, as well, you were a bit skeptical at first. (I, in fact, received the email on April Fool’s Day, the same day I heard a radio broadcast about a baby Tyrannosaurus Rex having been sighted in the Congo—April Fool!) As most others did, I “ooo’d and ahhh’d” as I watched Chiang Mai use a brush and apply paint to canvas. The resulting painting was startling in both composition and technique. I particularly noticed the way the elephant’s legs were painted, showing a sense of proportion I, at least don’t have. The video I’ve seen most around the Internet is this eight-minute one showing Chiang Mai creating a self-portrait. I’m particularly moved by what the elephant paints last. I’ve seen a few comments regarding the fact that during most of the actual painting we’re shown only the elephant’s trunk holding the paint brush, and therefore we could have been duped with a “fake trunk”! This one shows the entire elephant from a distance. And this one is a lovely tour through the elephants’ gallery, with nice music. I didn’t realize when I first saw the YouTube videos that some of the elephants had been taught to paint by abstract artists. CBS News did a News Magazine piece on this (which I missed 😦 ) and has a short synopsis on their site. There is a book available called Elephants of Thailand which offers insight into the role these animals have played in art and culture there. I’ve always had a fondness for these animals, and found it tragic that in some countries they’ve been used, abused, and slaughtered for their ivory. They are quite friendly and loyal if treated well, and they mourn for their dead, and exhibit grief when unkindly parted from their small ones. They have a rich cultural, mythological and religious history as well. I appreciate the portrayal of Ganesh in Indian culture. Gradually as I aged, I began to feel that the animals, especially the big ones like elephants weren’t happy at the Zoo. I asked my parents about this, and it seemed to be their feeling that animals didn’t care about happiness. It was wrong to mistreat them, of course, but they really didn’t notice anything as long as they got fed and had a comfy place to sleep. I must admit I never bought this point of view. I have since learned to “talk to the animals”—well, at least some of them, and have come to believe that they exhibit a different—not “lower” but different—kind of consciousness to those of us who use spoken language as our main definer of intelligence. I’m glad the S.F. Zoo and many others have taken great strides in improving their habitats. In fact one of the reasons the tiger got loose is because the Zoo had tried to make the habitats less restrictive with lower walls. It seems they didn’t get the balance right. Still, though, I’m uncomfortable with keeping lots of animals on exhibit. We used to do that with, shall I say “unusual” looking people, too, and of course now we see that as wrong. I am for large and less-confining habitats for endangered species, and even scientific study of them, if some effort has been made to gain the animal’s permission for such. (Yes, there are ways to do this). I’m not sure when this became an anti-Zoo rant. I’m sure Zoos have their place, as all of conscious creation does. It’s just when I come across a story like Chiang Mai’s, I like to think there is another way. Rather than attempting to control other life forms, perhaps, perhaps, we can listen to and learn from them. There are many sayings that start out with the words: “There are two kinds of people in the world,” and go on to say, usually “Those who -X-, and those who -Y-“. (“X” and “Y” stand for any two contrasting characteristics). There are three kinds of people in the world: those who can count and those who can’t. There are two kinds of people in the world: those who divide the world into two kinds of people, and those who don’t – Robert Benchley (This last is quoted by Book Browse, a book finder’s site which has an interesting genre classification system [a topic dear to my heart]). And one more, stretching that last one even further: There are two kinds of people in the world: Those who think you can reduce all people into two categories (they are called managers) and those who think categorizing all the people in the world into two categories is absurd (they are called philosophers—by managers). Lest you begin to wonder whether there is a point to this post, I’ll get to it. Oh, wait, first, one more before the main one (this really does bring me to what I plan to write about today, honest! ): There are two kinds of people in the world: Those who let the chips fall where they may, and those who like to arrange them in neat little piles. The “two points of view” or “kinds of people” described here seem to me to fuel the debate between those who feel they know what’s best for others, and those who may or may not know, but believe that others views are their own business. I tend to side with the latter point of view. I don’t necessarily agree with Brown’s character that the opposing point of view is that people are “evil”, but it certainly appears many think we do need to be controlled. I was stuck by the notion that the definition of what is “evil” depends upon who is in power. It seems impossible to maintain a consistent system of universal values if that’s true. I have no objection to anything anyone wishes to believe, however I do decline offers to let me know why their beliefs are the right ones, and mine are not. Some of those wishing to share this information include religious observers, philosophers, and scientists. Whatever they may think they can “prove” to me whether by empirical evidence or through faith, they seem to forget—or not want to acknowledge—that we are each individuals, with a belief system tailored to each AS an individual. If we’re reasonably competent adults, we are probably intelligent enough to examine existence, draw our own conclusions—perhaps with input from advisers, friends, family and literature—and discover our own world view as we go. As another of my favorite mystery writers (Sue Grafton) says “…if I can’t keep an open mind, I’d better keep my mouth shut, too!”. I think Ms. Brown’s quote sums up the opposing factions quite well, and wanted to share it with you. Do you agree about the two “kinds”? Thanks for reading, and peace to you.